The Kakatiya dynasty has ruled Warangal for many years and this kingdom was very much successful during their reign. It was in the 13th Century that Warangal Fort was built and King Ganapatideva was ruling Warangal and decided to move the capital from hanamkonda to Warangal where the new city was built. The new city with its fort was build in a circular way with 3 rings of walls for security and safety. The first ring of the Fort has high walls which are made out of heavy granite blocks and no motor was used to join the blocks. such is the architecture used in those days. The other walls are made out of mud. The walls dimensions are 56 feet in height and 72 feet wide. in the inner side of the walls there are steps which lead to the path on the top. It is said that soldiers used to patrol on the walls guarding the fort. The fort was completed by Rani Rudramadevi the daughter of King Ganapatideva in 1261 AD. The fort has 45 towers and pillars spread over a radius of 19 km, and a temple of Mother Earth called Sri Bhudevi Alayam in the center. 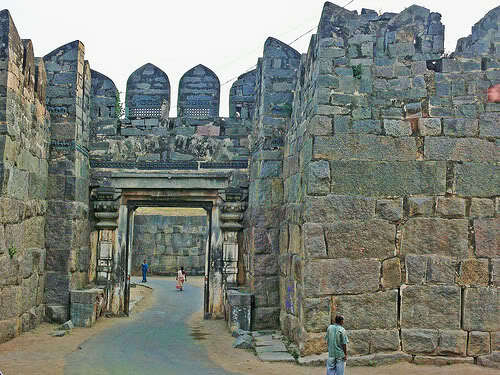 The beautifully carved gateway located within the fort are the famous 'Ekashila thoramns' symbolizes the Kakatiya Empire. The fort has four gateways on each side shows the creation of the then architects. The fort was popularly known then as the seat of power and army was very strong and well equipped. It is very difficult for the enemies to cross the inner ring of the fort because between the two walls are ponds which are full of crocodiles. The kakatiyas were also skilled in architecture and the many temples built by them bears examples for their innovation and creativity. There are some Islamic buildings within the fort which dates back to 14 century which is when the Thuglak armies captured the fort and then the Muslim rulers ruled this place. It is said that the kakatiya period was the brightest period of the Telugu history because they were Telugu speaking and they encouraged the Telugu culture.